Over the past couple of decades, technology has advanced at a remarkable rate -machines are getting smaller, more versatile, more competent, faster and generally more impressive! One of the newest and most utilised of these advancements is wireless technology, something that thankfully renders the gaggle of cables and wires trailing that once trailed over the house void. Having a basic understanding of what a wireless network is, how it works can, and how it can potentially be exploited can only serve to empower computer users against criminals and identity theft, especially when shopping online. So what exactly is a wireless network? In the simplest of terms, the answer is basically when computers are connected via radio waves. The computer is connected to the Internet via a wireless router, which routes all Internet-based requests to and from the computer. This can include anything from loading a web page, downloading software, or sending a payment transaction from your computer. So why can this be a problem? Trouble occurs with computers that don't operate over a securewireless network. Other computers that fall within range of the wireless network can connect to that network. This means that non-secure networks will allow those attacking computers that have then connected to the network to view everything that is viewed by the original user. Of course this can include personal information such as bank or credit card details. Passwords that are stored by the computer in the web browsers could also be accessed with relative ease. Obviously, this isn't an ideal scenario, as it makes purchasing products really easy on sites that store credit card details for future purchases. Another potential problem with unsecured wireless networks are what are known as 'key loggers'. This is a piece of software that is maliciously placed on the targeted computer by hackers that can access the wireless network. Even if password details are replaced by an asterix (*)for each character, the key logger does exactly what it says on the tin - the software will record each key pressed on the keyboard and transmit this information back to the hacker, providing them with all the info they need to access your account or use your credit card. Similar to this is something known as 'packet sniffing - packet refers to a small amount of information that is continuously sent over the network. Basically if another computer is able to connect to your wireless network, it has a means to monitor your network traffic using this software. So any otherwise private information such as credit card details that you type in can be 'sniffed' and used fraudulently. So all this may seem a bit scary and might put you off using or installing a wireless network! But go back and re-read the above - it all refers to unsecured wireless networks that are left vulnerable to attack and infiltration. The simple but crucial act of securing your network against intruders and fraudulent activity is actually relatively easy. 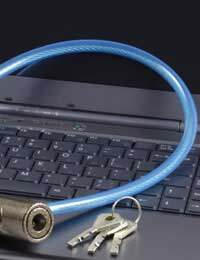 Wireless networks can be secured using encryption, so any computer that wants to connect to the network must have the 'encryption key'. This is like a secret password and usually consists of many letters and digits, so is virtually impossible to guess. Without the encryption key, nobody will be able to access your wireless network and therefore any threats posed to you and your online shopping will be greatly reduced. These days when buying your wireless network card, it usually comes with the software ready to be installed with the network card. It is vitally important that you don't neglect to do this very simple task. You should also consider taking an extra precaution in installing a virus and spy checker that regularly scans your computer. This sort of software can perform daily checks if you wish it to, and will root out any attempts to install, and remove 'key logger' software. All in all, keeping your wireless network secure is a pretty simple operation, and once installed the majority of networks will then run smoothly, keep you and your details safe and secure.